June is a month of long days hopefully they will be warm and dry and the nights frost free, we should be able to harvest early crops and fill any remaining space with pot grown plants and new sowings. Weeding is an ongoing but necessary task either Hoe, ideally on a warm dry day or remove them by hand when small, put them in the Compost Bin (except for perennial and deep rooted weeds). Continue to collect rainwater in Water Butts with a Rain Water Diverter attached to your downpipe. Be extra vigilant Slugs and Snails love warm damp weather and will devour most of your crops faster than you can, protect plants with environmentally friendly Slug Gone or add Copper Tape to Containers, Pots and around Raised Beds. Protect Brassicas, Lettuce and other susceptible crops from Insects, Birds and Rabbits with Enviromesh. Check containers and window boxes and water daily if necessary. Be prepared for dry weather treat yourself or a fellow gardener to a new Watering Can. If you have the space to grow more herbs, flowers, vegetables and fruit but haven't got the time to grow them why not order a ready grown garden pack online and they will be delivered to your door ready for planting out, it would make a lovely Fathers Day gift. Plant a Tree (Fruit, Nut, or a variety beneficial to Wildlife). Give Pot grown fruit trees a high potash liquid feed and keep watered in dry weather, pull off suckers that appear at the base of trees. Remove fleece or cloches from Strawberries and place straw under the plants to keep the fruit clean and prevent rotting. Peg down Strawberry runners if you want new plants or remove to encourage a better plant next year. Continue to tie in new shoots of Blackberry, Loganberry and Raspberry Canes using the Gripple System. Cover soft fruits with Netting or Fruit Cages to prevent birds eating your crop. In a sunny and sheltered position plant out outdoor Tomatoes into Growbags or large pots. Growing your plants in Tomato Pot Rings will increase their root space and promote healthier growth and a better crop, watering and feeding is easier and goes direct to the roots where it is needed, provide support for your plants. Remove side shoots on cordon varieties of tomatoes (these grow between the stem and the leaf axis). Start feeding your Tomatoes once the first truss has set. Plant out Outdoor Cucumber plants (as per tomatoes above). Pumpkins and Courgettes can be planted out now, dig in plenty of compost or well rotted manure and sprinkle general purpose fertiliser around the plant then water in well. Continue to earth up potatoes when the shoots are about 23cm high and keep the beds weed free. Plant out pot grown French Beans and Runner Beans or sow seeds directly in the ground where they are to grow, sow a few extra seed at the end of the rows to fill any gaps. Beans love a moist soil with plenty of compost or well rotted manure, rake in a general purpose fertiliser 2 weeks before planting/sowing. Provide tall supports with netting for the Climbing French/Runner Beans. Remove any 'premature' seed heads that appear on your onions. Grow shop bought Watercress Stems in containers. Continue to sow salad crops of Rocket, Lettuce, Radish and Spring Onion every couple of weeks for a continuous supply. Plant out pot grown Sweet Corn when they have a good root system, plant in blocks rather than rows to aid wind pollination. Support and pinch out tips of Broad Beans as the first beans appear to reduce the risk of blackfly attack. Transplant Cabbages, Broccoli, Brussels Sprouts, Cauliflower and Kale plants in rows in their final positions and protect from pests with Enviromesh. Thin out sowings of Swedes, Turnip, Leaf Beet and Spinach. Plant out Leeks into 15cm holes made with a dibber and fill the hole with water, you do not need to fill the hole with soil. Once established put Hanging Baskets and Window Boxes outside in their final positions. Thin out Carrots when they start to form roots pulling out alternate ones and repeat as the Carrots grow, eat any that you pull out that are large enough. Re-cover with Enviromesh to protect from Carrot root fly. Sow extra rows of Beetroot in rows in soil that has not been recently manured for an extended crop. Support earlier sowings of Peas as they grow and make any final sowings. growth and a better crop, watering and feeding is easier and goes direct to the roots where it is needed. Remove side shoots on cordon varieties (these grow between the stem and the leaf axis). 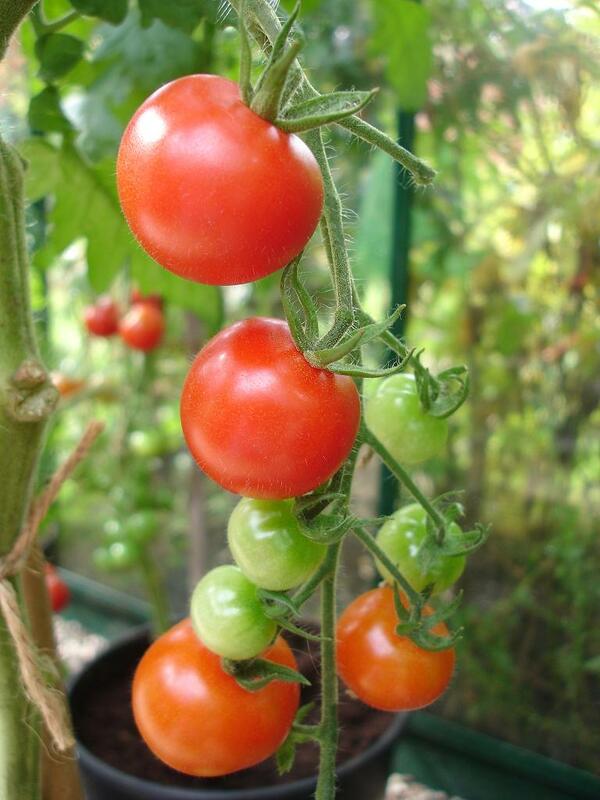 Ensure that Tomatoes are watered regularly to prevent blossom end rot. Plant up Peppers (Sweet and Chilli) into large potsor Growbags, be careful not to over water, allowing the compost to dry out between waterings. Water in the greenhouse when cool (morning/evening) avoiding the middle of the day as water can scorch leaves. Plant indoor Cucumber plants in a Growbag/Large Pot and provide support. Continue sowing Herbs to replace any exhausted plants. Open greenhouse vents and doors on warm days to allow the air to circulate and allow pollinating insects access, in hot weather ‘water’ the greenhouse floor to increase moisture levels. 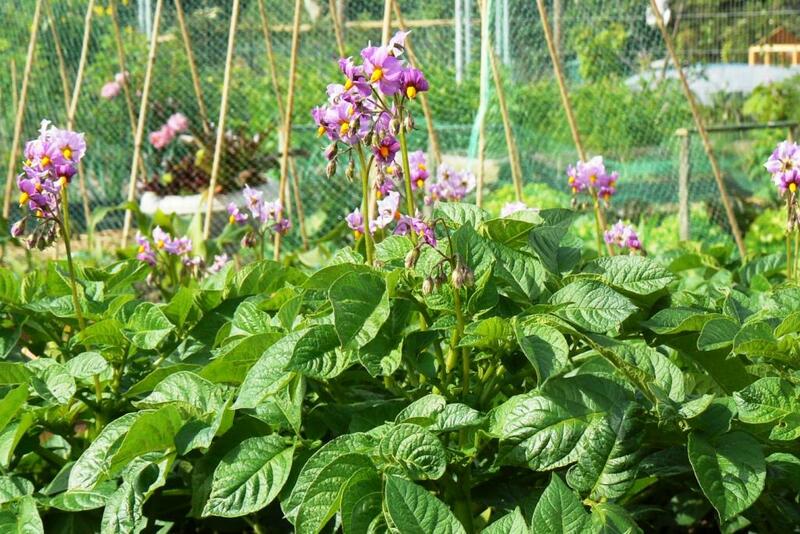 Dig up ‘New’ or First Early Potatoes once the flowers open or the buds drop, use a Potato Scoop to prevent damaging the potatoes. Asparagus Spears can be cut but leave if your plants are less than two years old. Pick early sowings of peas – delicious eaten straight from the pod a gardeners treat! Autumn or late winter sowings of Broad Beans should be producing pickable crops. Pick early sowings of Spinach grown under Cloches. Salad Leaves, Spring Onions, Radishes and Herbs. Continue to feed birds ideally with protein rich food such as live Mealworms, provide fresh water in your bird baths for the birds to drink and bathe in. Put peanuts into Birdfeeders as whole peanuts can choke young birds. Live mealworms are juicy and full of protein they provide a ready meal for young, hungry chicks, serve up in a bowl so that they can't escape. Stick Window Webs onto your windows to make them more visible to young birds. Put up a Bat Box for these beautiful secretive night time creatures to live in. Treat ponds overgrown with algae and blanket weed with Pond Magic to return to crystal clear water. Place any blanket or pond weed that you remove by the pond to allow any creatures to return to the water. Plant out your Sunflower plants, provide support and tie in, protect from Slugs and Snails. Put out Hedgehog food and fresh water to help and encourage these prickly creatures into your garden. Put up a Pollinating Bee Log, or a Solitary Bee Hive to provide a home for Solitary Bees and to attract them into your garden to pollinate your crops. Look after our Butterflies, Moths and Bees by providing a Butterfly and Moth Feeder, Butterfly/Bee Nectar Feeding Station, or a Butterfly Biome. If you are interested in insects put up an Illuminated Minibeast Centre which lights up at night attracting insects inside which you can then study, identify and release the following day. Now is the time to start planning and planting your school garden for the autumn, winter and spring so that you will be picking crops throughout the year. Well the days are still short and the outdoors can feel pretty chilly but there is still lots be doing in the garden at this time of year. This is one of the busiest times of the gardening year, and here have some helpful pointers on gardening jobs that can be done around now.